This article describes the design and implementation of a simple Towers of Hanoi 'game.' The game provides a graphical animation that moves discs from the leftmost pin to the rightmost pin. The user controls the speed of the animation and how many discs to use.This app was written using 'portable' HTML5 and runs in all major browsers. This makes it easy to create a hybrid version of the app, i.e. a native webview wrapped version. The source code for this sample can be found here: https://github.com/gomobile/sample-towers-of-hanoi, or download the Intel® XDK to check out all the HTML5 samples. The first thing to note is that the visual elements of the app are all rectangles, e.g. discs, pins, plates, and control buttons. The width/height proportions of those rectangles are flexible and can be adjusted to fill out the available space on the screen. It would therefore make sense to have all those elements be HTML tags, whose width and height are dynamically adjusted. The number of discs is variable, so dynamically creating the visual elements is the natural thing to do. jQuery is a convenient framework for dynamically creating the HTML content and it provides a handy .animate method for animating the position of any element on the page, so it's a natural fit for what we need to do. jQuery is also a very convenient way to write 'browser independent' code. It abstracts away browser differences. 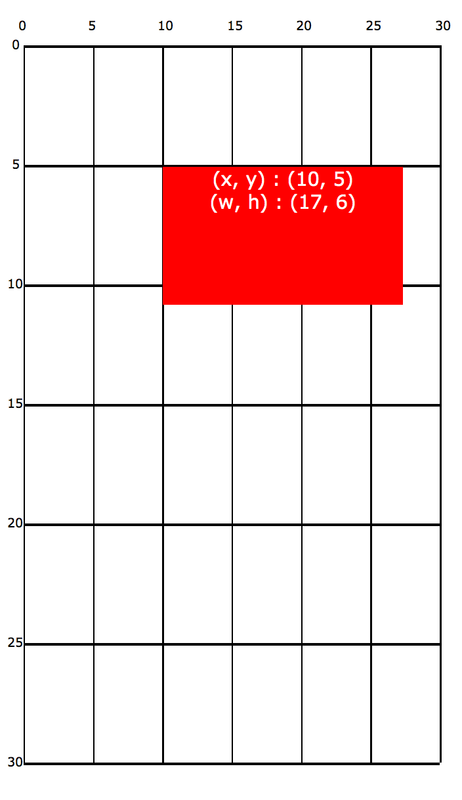 The two illustrations above show how a red box is placed in a 30 x 30 virtual coordinate system. The red box has the virtual dimensions (17 x 6) and is placed with the top left corner at (10,5). The illustrations show how the virtual coordinate system and it's contained elements adapts to the dimension of the screen. There's only one instance of this object and it is mapped to the only DOM element inside the body of the HTML document. All other DOM elements are dynamically created. The dimensions (30x30) is chosen somewhat arbitrarily. Note, it is possible to use fractional values for positions, so this is not limiting the granularity of sizes and positions of the elements on the surface. The jQuery objects for the pins and plates are created by using the jQuery ($) function to create a <DIV> element to which a class is added with the addClass method. The .appendTo method is used to add the newly created DOM element as the last DOM element inside the jsurface parent DOM element. Note, the chaining of the jQuery methods calls. Each jQuery call will return a jQuery object representing the modified object. This stroke of genious is what makes this very convenient chaining pattern possible. Each plate is 8 wide and is separated by 2. The right and leftmost plates are placed 1 from the edge. Each pin is 1 wide and 25 tall and placed in the middle of the plates and 5 down from the top. This is how the magical coordinates shown above have been decided on. Feel free to go over the math. Since we need to be able to have the user specify the number of discs, a parameter 'disc_count' is used by this function. The width of the discs ranges from 7 for the largest one, to 3 for the smallest one. The height of the discs is computed, so that the total height of the stack is 20. Another possibility is to have a constant disc height. It is easy to make that happen with a minor modification to the code above. Also, note that the background CSS property is set from an array of colors. This will make the discs have different colors. The discs created are stored in the discs array during creation. That way we have their surface handles available when they must be removed from the surface. Note, that each disc needs to be removed from both the DOM and the surface. The removal from the DOM is done with the jQuery .remove() method and removal from the surface is done with the .Remove_Elem() method. The Resize_To_Window() function retrieves the pixel width and height of the window using the jQuery .width and .height methods. Those values are then used to set the pixel size of the DOM element representing the surface. The surface method to set the scaling and repositioning of all the elements kept track of; Position_All(), is called after the scaling factors have set with the call to Set_Scale (). The Resize_To_Window() function is set to be called whenever the window changes size using the jQuery .resize method. The pins are indexed with 0,1,2 and the current position of where the discs are currently located are kept in arrays; one for each pin. The elements of those arrays are the surface identifier for the discs. Each disc move is comprised of three individual moves; up to the top of the pin it curretnly sits on, across to the target pin, and then down to the top of the target pin. The distances to travel in the x and y direction is derived from the pin positions and the size of the stack on the target pin. The reason for the callback parameter is to have a way to indicate to the caller when the moves have actually completed. Due to animation they don't happen instantaniously. When multiple animations are sequenced on the same elem jQuery will handle the sequencing just fine. However, it is not able to handle the sequencing when multiple elements needs to be sequenced, so this has to be dealt with 'manually'. Each call to Move_Disc_Queue () will simply build up the queue of moves in the queue array. Readers should recognize the standard recursive implementation of the Towers of Hanoi algorithm. When the queue is ready to be processed a call to Process_Queue () is issued. This will start processing the queue. Note, that Process_Queue is provided as the callback to be called when the current animation finishes, thereby causing the next disc to move. Also, note that the variable 'state' must be set to 'running' in order for the processing of the queue elements to continue. This allows the user to temporarily stop the animation at any time. The standard array operations .push and .shift is used to add to the end of the queue and to remove the first element from the queue, respectively. Finally, I added some CSS to make the elements look pretty and to remove borders, and remove the scroll bar. The most important aspect of these are 'position:absolute'. If the positioning is not set to be absolute the positioning in the virtual coordinate system wont work. The dropped shadow is added the same way to the pins, plates, and discs to give a 3D effect. Also rounded corners are added to the discs and pins. The font-size of the text used in the control buttons doesn't resize with the window. There are two ways I can think of to make that happen; Either use an image for the control which is resized to fit in the control, or have the Position_All() function adjust the font size of all the elements kept track of as well. It seems to be the case that the resize event doesn't always fire when orientation is changed. To fix this the Resize_To_Window() function can be invoked when the orientationchange event fires. When clicking on the controls fast, some of those clicks might trigger the double-click-to-zoom behavior of some browsers (iOS). To prevent a zoom from happening zooming should be disabled. I believe this can be done with a META tag. I just haven't gotten around to it yet. When running the app in a mobil browser there's a way to get rid of the browser controls (back button, bookmark button, etc). This should be done to leave more space for the app. This sample is ported to Windows 8* Store as well. Please see this article Porting HTML5 Samples to Windows 8* Store for detail information.